Differences between == (double equal operator) and .equals() method? The following are some of important classes present in java.lang package. For writing any java program the most commonly required classes and interfaces are encapsulated in the separate package which is nothing but java.lang package. It is not required to import java.lang package in our program because it is available by default to every java program. What is your favorite package? Why java.lang is your favorite package? It is not required to import lang package explicitly but the remaining packages we have to import. For any java object whether it is predefine or customized the most commonly required methods are encapsulated into a separate class which is nothing but object class. As object class acts as a root (or) parent (or) super for all java classes, by default its methods are available to every java class. If our class extends any other class then it is the indirect child class of Object. We can use this method to get string representation of an object. Whenever we are try to print any object reference internally toString() method will be executed. If our class doesn't contain toString() method then Object class toString() method will be executed. In the above program Object class toString() method got executed which is implemented as follows. 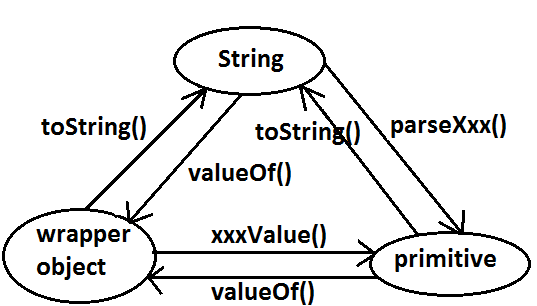 To provide our own String representation we have to override toString() method in our class. Ex : For example whenever we are try to print student reference to print his a name and roll no we have to override toString() method as follows. In String class, StringBuffer, StringBuilder, wrapper classes and in all collection classes toString() method is overridden for meaningful string representation. Hence in our classes also highly recommended to override toString() method. For every object jvm will generate a unique number which is nothing but hashCode. Jvm will using hashCode while saving objects into hashing related data structures like HashSet, HashMap, and Hashtable etc. If the objects are stored according to hashCode searching will become very efficient (The most powerful search algorithm is hashing which will work based on hashCode). If we didn't override hashCode() method then Object class hashCode() method will be executed which generates hashCode based on address of the object but it doesn't mean hashCode represents address of the object. Based on our programming requirement we can override hashCode() method to generate our own hashcode. Overriding hashCode() method is said to be proper if and only if for every object we have to generate a unique number as hashcode for every object. It is improper way of overriding hashCode() method because for every object we are generating same hashcode. It is proper way of overriding hashcode() method because for every object we are generating a different hashcode. In this case Object class toString( ) method got executed which is internally calls Object class hashCode( ) method. In this case Object class toString( ) method got executed which is internally calls Test class hashCode( ) method. In this case Test class toString() method got executed. if we are giving opportunity to Object class toString() method it internally calls hashCode() method. But if we are overriding toString() method it may not call hashCode() method. We can use toString() method while printing object references and we can use hashCode() method while saving objects into HashSet or Hashtable or HashMap. We can use this method to check equivalence of two objects. If our class doesn't contain .equals() method then object class .equals() method will be executed which is always meant for reference comparison[address comparison]. i.e., if two references pointing to the same object then only .equals( ) method returns true . In the above program Object class .equals() method got executed which is always meant for reference comparison that is if two references pointing to the same object then only .equals(() method returns true. In object class .equals() method is implemented as follows which is meant for reference comparison. Based on our programming requirement we can override .equals() method for content comparison purpose. Meaning of content comparison i.e., whether we have to check the names are equal (or) roll numbers (or) both are equal. If we are passing different type of objects (heterogeneous object) our .equals() method should return false but not ClassCastException i.e., we have to handle ClassCastException to return false. If we are passing null argument our .equals() method should return false but not NullPointerException i.e., we have to handle NullPointerException to return false. The following is the proper way of overriding .equals() method for content comparison in Student class. To make .equals() method more efficient we have to place the following code at the top inside .equals() method. In String class .equals( ) is overridden for content comparision hence if content is same .equals( ) method returns true , even though ths objects are different. In StringBuffer class .equals( ) is not overriden for content comparision hence Object class .equals( ) will be executed which is meant for reference comparision , hence if objects are different .equals( ) method returns false , even though content is same. If r1==r2 is true then r1.equals(r2) is always true i.e., if two objects are equal by == operator then these objects are always equal by .equals( ) method also. If r1==r2 is false then we can't conclude anything about r1.equals(r2) it may return true (or) false. If r1.equals(r2) is true then we can't conclude anything about r1==r2 it may returns true (or) false. If r1.equals(r2) is false then r1==r2 is always false. It is an operator applicable for both primitives and object references. It is a method applicable only for object references but not for primitives. In the case of primitives == (double equal operator) meant for content comparison, but in the case of object references == operator meant for reference comparison. By default .equals() method present in object class is also meant for reference comparison. We can't override== operator for content comparison in object references. We can override .equals() method for content comparison. If there is no relationship between argument types then we will get compile time error saying incompatible types. (relation means child to parent or parent to child or same type)	 If there is no relationship between argument types then .equals() method simply returns false and we won't get any compile time error and runtime error. For any object reference r, r==null is always false. For any object reference r, r.equals(null) is also returns false. in general we can use == (double equal operator) for reference comparison whereas .equals() method for content comparison. If 2 objects are equal by .equals() method compulsory their hashcodes must be equal (or) same. That is If r1.equals(r2) is true then r1.hascode()==r2.hashcode( ) must be true. If 2 objects are not equal by .equals() method then there are no restrictions on hashCode() methods. They may be same (or) may be different. That is If r1.equals(r2) is false then r1.hashCode()==r2.hashCode() may be same (or) may be different. If hashcodes of 2 objects are equal we can't conclude anything about .equals() method it may returns true (or) false. That is If r1.hashCode()==r2.hashCode() is true then r1.equals(r2) method may returns true (or) false. If hashcodes of 2 objects are not equal then these objects are always not equal by .equals() method also. That is If r1.hashCode()==r2.hashCode() is false then r1.equals(r2) is always false. To maintain the above contract between .equals() and hashCode() methods whenever we are overriding .equals() method compulsory we should override hashCode() method. Violation leads to no compile time error and runtime error but it is not good programming practice. Consider the following person class. Which of the following is appropriate way of overriding hashCode() method? Based on whatever the parameters we override ".equals() method" we should use same parameters while overriding hashCode() method also. Note: in all wrapper classes, in string class, in all collection classes .equals() method is overridden for content comparison in our classes also it is highly recommended to override .equals() method. Which of the following is valid? The process of creating exactly duplicate object is called cloning. We can perform cloning by using clone() method of Object class. We can perform cloning only for Cloneable objects. An object is said to be Cloneable if and only if the corresponding class implements Cloneable interface. Cloneable interface present in java.lang package and does not contain any methods. It is a marker interface where the required ability will be provided automatically by the JVM. If we are trying to perform cloning or non-clonable objects then we will get RuntimeException saying CloneNotSupportedException. The process of creating bitwise copy of an object is called Shallow Cloning . If the main object contain any primitive variables then exactly duplicate copies will be created in cloned object. If the main object contain any reference variable then the corresponding object won't be created just reference variable will be created by pointing to old contained object. Shallow cloning is the best choice , if the Object contains only primitive values. 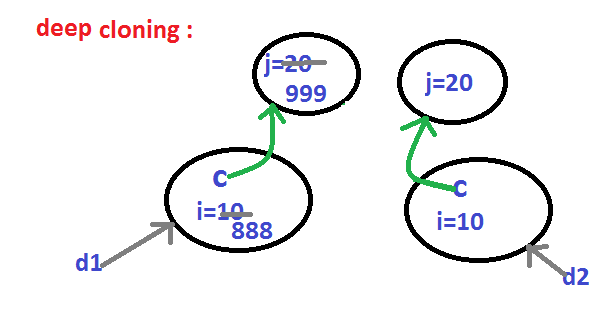 In Shallow cloning by using main object reference , if we perform any change to the contained object then those changes will be reflected automatically in cloned copy. To overcome this problem we should go for Deep cloning. The process of creating exactly independent duplicate object(including contained objects also) is called deep cloning. In Deep cloning , if main object contain any reference variable then the corresponding Object copy will also be created in cloned object. Object class clone( ) method meant for Shallow Cloning , if we want Deep cloning then the programmer is responsible to implement by overriding clone( ) method. In Deep cloning by using main Object reference if we perform any change to the contained Object those changes won't be reflected to the cloned object. Which cloning is best ? If the Object contain reference variables then Deep cloning is the best choice. Cloning by default Shallow cloning. This method returns runtime class definition of an object. Ex : To print Connecton interface implemented vendor specific class name . Just before destroying an object GC calls finalize( ) method to perform CleanUp activities . Once we create a String object we can't perform any changes in the existing object. If we are try to perform any changes with those changes a new object will be created. This behavior is called immutability of the String object. Once we created a StringBuffer object we can perform any changes in the existing object. This behavior is called mutability of the StringBuffer object. In String class .equals() method is overridden for content comparison hence if the content is same .equals() method returns true even though objects are different. In StringBuffer class .equals() method is not overridden for content comparison hence Object class .equals() method got executed which is always meant for reference comparison. Hence if objects are different .equals() method returns false even though content is same. 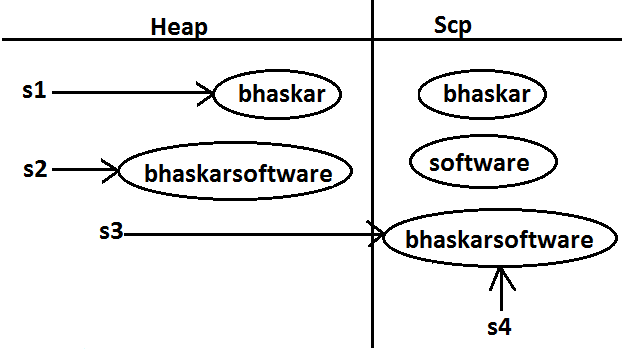 In this case two objects will be created one is on the heap the other one is SCP(String constant pool) and s is always pointing to heap object. In this case only one object will be created in SCP and s is always referring that object. Object creation in SCP is always optional 1st JVM will check is any object already created with required content or not. If it is already available then it will reuse existing object instead of creating new object. If it is not already there then only a new object will be created. Hence there is no chance of existing 2 objects with same content on SCP that is duplicate objects are not allowed in SCP. Garbage collector can't access SCP area hence even though object doesn't have any reference still that object is not eligible for GC if it is present in SCP. All SCP objects will be destroyed at the time of JVM shutdown automatically. When ever we are using new operator compulsory a new object will be created on the Heap . There may be a chance of existing two objects with same content on the heap but there is no chance of existing two objects with same content on SCP . i.e., duplicate objects possible in the heap but not in SCP . For every String Constant one object will be created in SCP. Because of runtime operation if an object is required to create compulsory that object should be placed on the heap but not SCP. In our program if any String object is required to use repeatedly then it is not recommended to create multiple object with same content it reduces performance of the system and effects memory utilization. We can create only one copy and we can reuse the same object for every requirement. 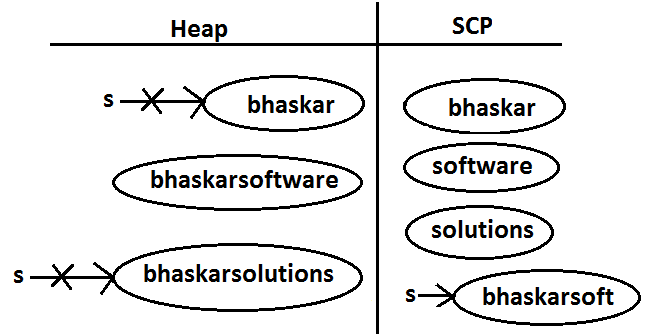 This approach improves performance and memory utilization we can achieve this by using "scp". In SCP several references pointing to same object the main disadvantage in this approach is by using one reference if we are performing any change the remaining references will be impacted. To overcome this problem sun people implemented immutability concept for String objects. According to this once we creates a String object we can't perform any changes in the existing object if we are trying to perform any changes with those changes a new String object will be created hence immutability is the main disadvantage of scp. What is the main difference between String and StringBuilder? What is the main difference between String and StringBuffer ? Other than immutability and mutability is there any other difference between String and StringBuffer ? In String .equals( ) method meant for content comparison where as in StringBuffer meant for reference comparision . What is the meaning of immutability and mutability? Explain immutability and mutability with an example? A specially designed memory area for the String literals/objects . What is the advantage of SCP? Instead of creating a separate object for every requirement we can create only one object and we can reuse same object for every requirement. This approach improves performance and memory utilization. What is the disadvantage of SCP? In SCP as several references pointing to the same object by using one reference if we are performing any changes the remaining references will be inflected. To prevent this compulsory String objects should be immutable. That is immutability is the disadvantage of SCP. Why SCP like concept available only for the String but not for the StringBuffer? As String object is the most commonly used object sun people provided a specially designed memory area like SCP to improve memory utilization and performance. But StringBuffer object is not commonly used object hence specially designed memory area is not at all required. Why String objects are immutable where as StringBuffer objects are mutable? In the case of String as several references pointing to the same object, by using one reference if we are allowed perform the change the remaining references will be impacted. To prevent this once we created a String object we can't perform any change in the existing object that is immutability is only due to SCP. But in the case of StringBuffer for every requirement we are creating a separate object will be created by using one reference if we are performing any change in the object the remaining references won't be impacted hence immutability concept is not require for the StringBuffer. Similar to String objects any other objects are immutable in java? In addition to String objects , all wrapper objects are immutable in java. Is it possible to create our own mutable class? Explain the process of creating our own immutable class with an example? What is the difference between final and immutability? What is interning of String objects? 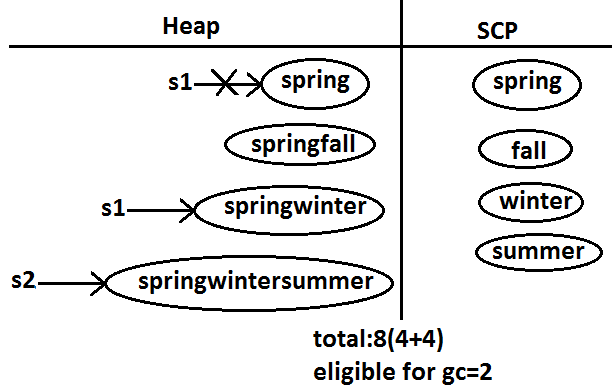 By using heap object reference, if we want to get corresponding SCP object , then we should go for intern() method. If the corresponding object is not there in SCP then intern() method itself will create that object and returns it. Creates an empty String Object. To create an equivalent String object for the given String literal on the heap. Creates an equivalent String object for the given StringBuffer. creates an equivalent String object for the given char[ ] array. Create an equivalent String object for the given byte array. Returns the character locating at specified index. The overloaded "+" and "+=" operators also meant for concatenation purpose only. For content comparison where case is important. It is the overriding version of Object class .equals() method. For content comparison where case is not important. Note: We can validate username by using .equalsIgnoreCase() method where case is not important and we can validate password by using .equals() method where case is important. Return the substring from begin index to end of the string. Returns the substring from begin index to end-1 index. Returns the number of characters present in the string. Note: length is the variable applicable for arrays where as length() method is applicable for String object. To replace every old character with a new character. Converts the all characters of the string to lowercase. Converts the all characters of the string to uppercase. We can use this method to remove blank spaces present at beginning and end of the string but not blank spaces present at middle of the String. It returns index of 1st occurrence of the specified character if the specified character is not available then return -1. It returns index of last occurrence of the specified character if the specified character is not available then return -1. Because runtime operation if there is a change in content with those changes a new object will be created only on the heap but not in SCP. If there is no change in content no new object will be created the same object will be reused. Once we created an object we can't perform any changes in the existing object. If we are trying to perform any changes with those changes a new object will be created. If there is no change in the content then existing object will be reused. This behavior is called immutability. Once we create a CreateImmutable object we can't perform any changes in the existing object , if we are trying to perform any changes with those changes a new object will be created. If reference variable declared as final then we can't perform reassignment for the reference variable it doesn't mean we can't perform any change in that object. That is by declaring a reference variable as final we won't get any immutability nature . final and immutability both are different concepts . In the above example even though "sb" is final we can perform any type of change in the corresponding object. That is through final keyword we are not getting any immutability nature. Which of the following are meaning ful ? If the content will change frequently then never recommended to go for String object because for every change a new object will be created internally. To handle this type of requirement we should go for StringBuffer concept. Creates an empty StringBuffer object with default initialcapacity "16". Creates an empty StringBuffer object with the specified initial capacity. 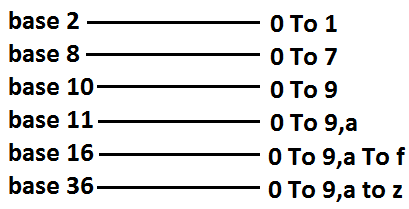 Return the no of characters present in the StringBuffer. Returns the total no of characters StringBuffer can accommodate(hold). It returns the character located at specified index. To replace the character locating at specified index with the provided character. public StringBuffer append(boolean b);      All these are overloaded methods. To insert at the specified location. To delete characters from begin index to end n-1 index. To delete the character locating at specified index. Consider only specified no of characters and remove all the remaining characters. To deallocate the extra allocated free memory such that capacity and size are equal. To increase the capacity dynamically(fly) based on our requirement. Every method present in StringBuffer is syncronized hence at a time only one thread is allowed to operate on StringBuffer object , it increases waiting time of the threads and creates performence problems , to overcome this problem we should go for StringBuilder. Every method present in StringBuffer is declared as synchronized hence at a time only one thread is allowed to operate on the StringBuffer object due to this, waiting time of the threads will be increased and effects performance of the system. To overcome this problem sun people introduced StringBuilder concept in 1.5v. Every method present in StringBuffer is synchronized. No method present in StringBuilder is synchronized. 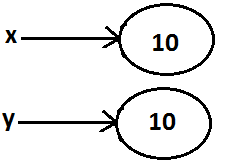 At a time only one thread is allow to operate on the StringBuffer object hence StringBuffer object is Thread safe. At a time Multiple Threads are allowed to operate simultaneously on the StringBuilder object hence StringBuilder is not Thread safe. It increases waiting time of the Thread and hence relatively performance is low. Threads are not required to wait and hence relatively performance is high. Introduced in 1.0 version. Introduced in 1.5 versions. If the content is fixed and won't change frequently then we should go for String. If the content will change frequently but Thread safety is required then we should go for StringBuffer. If the content will change frequently and Thread safety is not required then we should go for StringBuilder. For most of the methods in String, StringBuffer and StringBuilder the return type is same type only. 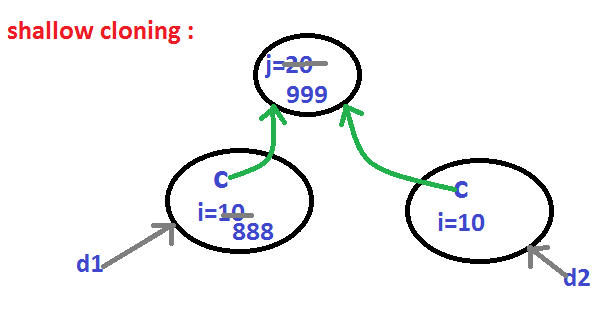 Hence after applying method on the result we can call another method which forms method chaining. 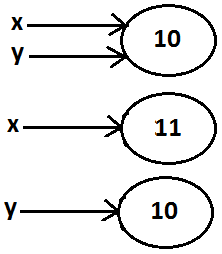 In method chaining all methods will be evaluated from left to right. To wrap primitives into object form so that we can handle primitives also just like objects. To define several utility functions which are required for the primitives. All most all wrapper classes define the following 2 constructors one can take corresponding primitive as argument and the other can take String as argument. If the String is not properly formatted i.e., if it is not representing number then we will get runtime exception saying "NumberFormatException". Float class defines 3 constructors with float, String and double arguments. Character class defines only one constructor which can take char primitive as argument there is no String argument constructor. Boolean class defines 2 constructors with boolean primitive and String arguments. If we want to pass boolean primitive the only allowed values are true, false where case should be lower case. If we are passing String argument then case is not important and content is not important. If the content is case insensitive String of true then it is treated as true in all other cases it is treated as false. 1)	In all wrapper classes toString() method is overridden to return its content. 2)	In all wrapper classes .equals() method is overridden for content compression. We can use valueOf() method to create wrapper object for the given primitive or String this method is alternative to constructor. Every wrapper class except Character class contains a static valueOf() method to create wrapper object for the given String. Every integral type wrapper class (Byte, Short, Integer, and Long) contains the following valueOf() method to convert specified radix string to wrapper object. the allowed radix range is 2 to 36. Every wrapper class including Character class defines valueOf() method to convert primitive to wrapper object. We can use xxxValue() methods to convert wrapper object to primitive. Every number type wrapper class (Byte, Short, Integer, Long, Float, Double) contains the following 6 xxxValue() methods to convert wrapper object to primitives. Character class contains charValue() method to convert Character object to char primitive. Boolean class contains booleanValue() method to convert Boolean object to boolean primitive. In total there are 38(= 6*6+1+1) xxxValue() methods are possible. We can use this method to convert String to corresponding primitive. Every wrapper class except Character class contains a static parseXxx() method to convert String to corresponding primitive. integral type wrapper classes(Byte, Short, Integer, Long) contains the following parseXxx() method to convert specified radix String form to corresponding primitive. We can use toString() method to convert wrapper object (or) primitive to String. Every wrapper class (including Character class) contains the above toString() method to convert wrapper object to String. It is the overriding version of Object class toString() method. Whenever we are trying to print wrapper object reference internally this toString() method only executed. Every wrapper class contains a static toString() method to convert primitive to String. Integer and Long classes contains the following static toString() method to convert the primitive to specified radix String form. Integer and Long classes contains the following toXxxString() methods. String, StringBuffer, StringBuilder and all wrapper classes are final classes. 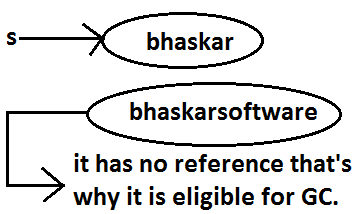 The wrapper classes which are not child class of Number are Boolean and Character. The wrapper classes which are not direct class of Object are Byte, Short, Integer, Long, Float, Double. Sometimes we can consider Void is also as wrapper class. In addition to String objects , all wrapper class objects also immutable in java. Sometimes Void class is also considered as wrapper class. Void is class representation of void java keyword. Ex : To check whether return type of m1( ) is void or not . Until 1.4 version we can't provide wrapper object in the place of primitive and primitive in the place of wrapper object all the required conversions should be performed explicitly by the programmer. But from 1.5 version onwards we can provide primitive value in the place of wrapper and wrapper object in the place of primitive all required conversions will be performed automatically by compiler. These automatic conversions are called Autoboxing and Autounboxing. Automatic conversion of primitive to wrapper object by compiler is called Autoboxing. After compilation the above line will become. That is internally Autoboxing concept is implemented by using valueOf() method. 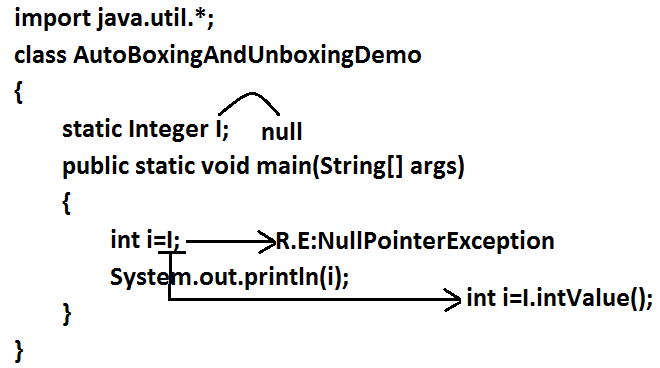 automatic conversion of wrapper object to primitive by compiler is called Autounboxing. 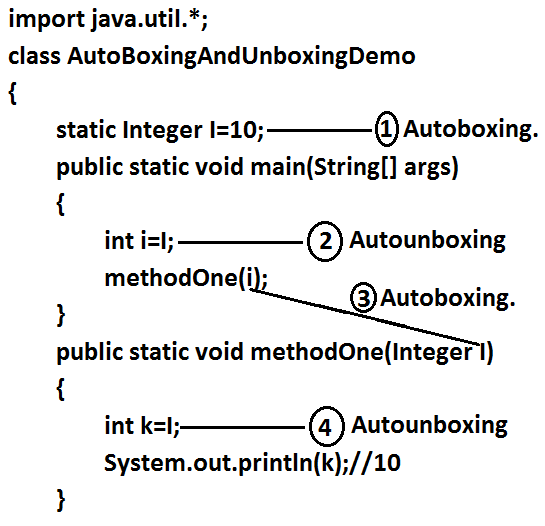 That is Autounboxing concept is internally implemented by using xxxValue() method. It is valid in 1.5 version but invalid in 1.4 version. From 1.5 version onwards we can use primitives and wrapper objects interchangly the required conversions will be performed automatically by compiler. All wrapper objects are immutable that is once we created a wrapper object we can't perform any changes in the existing object. To implement the Autoboxing concept in every wrapper class a buffer of objects will be created at the time of class loading. By Autoboxing if an object is required to create 1st JVM will check whether that object is available in the buffer or not. If it is available then JVM will reuse that buffered object instead of creating new object. If the object is not available in the buffer then only a new object will be created. This approach improves performance and memory utilization. In all the remaining cases compulsory a new object will be created. Internally Autoboxing concept is implemented by using valueOf() method hence the above rule applicable even for valueOf() method also. When compared with constructors it is recommended to use valueOf() method to create wrapper object. Converting a lower data type into a higher data type is called widening. In general var-arg method will get least priority i.e., if no other method matched then only var-arg method will get chance. It is exactly same as "default" case inside a switch. 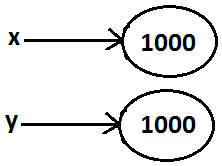 Widening followed by Autoboxing is not allowed in java but Autoboxing followed by widening is allowed. Which of the following declarations are valid ?